“Old breed?, New breed?, There’s not a damn bit of difference so long as it’s the MARINE breed!” Chesty Puller, USMC. August 29th marks the 98th Birthday of the United States Marine Corps Reserves. Congress passed the Naval Appropriations Act on this day in 1916. This Act is in charge of providing trained units to be mobilized for Active Duty in time of war or National Security. It is the largest command in the United States Marine Corp.
Today’s Reservist enlists for an 8 year term. The Reservist have to pass the ASVAB (Armed Service Vocational Aptitude Battery) which is a written test to determine qualifications in all the Armed Services. Each Reservist must pass Recruit Training (boot camp). This is a 13-week program that is set to the highest standards both physically and mentally. After graduation, Reservists go on to the 2nd phase of SOI (School of Infantry). But if your job is not infantry then you go onto MCT (Marine Combat Training). For Reservist it is off to home. They will train one weekend a month and two weeks out of the year. I do not make light of this; Reservist are held to the very high standards of every Marine. Reservist are critical to the overall combat readiness the Marine Corp demands. I am partial to the Marines because HONEY is a Marine Vet. And I don’t know a woman, 8 to 80 that does not stop to eye a Marine in his dress Blues! Three States ceded into the Union in the month of August throughout our history. Missouri was the first on August 10, 1821. It was the 24th State and that brought our National Flag to 24 stars and its design was 3 rows of 6 stars with alternating red and white stripe. Then came Colorado on August 1, 1876. It was the 38th State and the 38 stared Flag was 5 rows of alternating 8 in a row and 6 in a row. On August 21, 1959 Hawaii became the 50th State to join the Union. 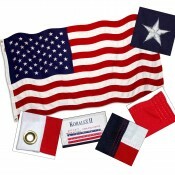 The individual State Flags can be found on the United States Flag Store for a great low price. Our 50 star Flag has a unique story that I would like to share because the adding of the 50th Star was done by a High School Senior. It was designed by Robert Heft, a 17 year old that was doing a history project. He took a 48 star Flag and measured out 100 stars on the blue section. Now this was back in 1959 and Alaska had just been admitted into the Union and this young man was pretty forward thinking. So he sewed the stars on with anticipation of Hawaii becoming a State. He turned his project in to his teacher Stanley Pratt. Well Pratt was not too impressed and Heft only received a B-. Heft, thinking ahead as usual argued his point that there would be 50 states in the future. Pratt told him if he could get Congress to accept his design he would change his grade to an A. Heft then sent the Flag to Congressman Walter Henry Moeller (Ohio) until we needed a 50 Star Flag. By August of 1959, President Dwight D. Eisenhower signed the proclamation to add Hawaii to the Union. Just to let you know Bob did finally get his “A” on his history project! Two little girls, a few dolls, and a wonderful playhouse = a whole lot of fun! Every little girl dreams. 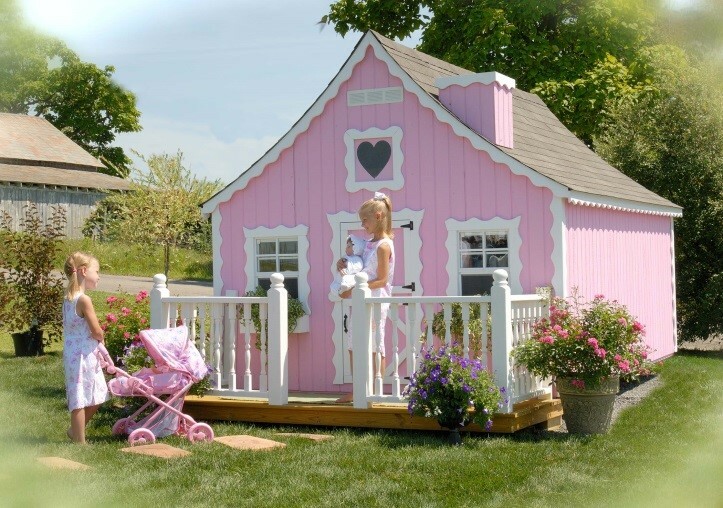 Just about any little girl would LOVE this playhouse in her backyard! There’s just one thing missing but don’t worry! The US Flag Store can fix it! We have darling little garden flags. Several in our fall line are just the thing for this playhouse! Each garden flag by BreezeArt® measures 12.5” x 18”. Individual metal stands that go into the ground or mount on the wall of the house beside the front door are also available. Pair it with a matching banner (28” x 40”) and mailbox cover for the big house! August 16, 1940 is the first established Army Parachute jump. In August of 2002, President George W. Bush put forth the proclamation for August 16th to honor the Airborne Forces, annually. The idea of men jumping out of planes was not a new one, it was tossed just after World War I by General William (Billy) Mitchell. The General tested this out in San Antonio, Texas as a demonstration. Although the jump went well, the theory did not catch on here in America. During World War II, Germany started to use paratroopers in 1940 to quickly invade and surprise the enemy behind their own resistance. Triggered by the success Germany’s Fallschirmjäger , the US Military branches began a full-scale production to develop this type of warfare. In April of 1940, the War Department approved a test platoon of Airborne Infantry under the Army’s Infantry Board, this was set up at Fort Benning 29th Regiment. Because the towers worked so well the Army purchased brought them to Fort Benning. In less than 45 days, on August 16, 1940, out of a Douglas B-18 over Lawson Field the first drop was held. Out of these 48 men, they held a lottery to see who would go after Lieutenant Ryder and Private William N. (Red) King. On August 29, 1940, the platoon made the first mass jump in the United States. Less than 45 days it took these dedicated men to be ready for their first jump. That is crazy-brave. The traditional paratrooper cry “GERONIMO” was originated in the 501st by Private Aubrey Eberhart to prove to a friend that he had full control of his faculties when he jumped. That cry was adopted by the 501st and has been often used by paratroopers since then. The First all black 555 Parachute Infantry Company is remembered as the Triple Nickel. Another landmark is in December 1973, when Privates Joyce Kutsch and Rita Johnson became the first women to graduate from the Basic Airborne Course. Victory Over Japan Day. The United States and the Allied Forces won victory over Japan during World War II. On August 15, 1945, just days after the Japanese cities of Hiroshima and Nagasaki were hit by the annihilating atomic bombs from American B-29 plane Enola Gay on August 6 & 9, 1945 consequently. This marked the end of World War II. The official surrender was not signed until September 2, 1945 aboard the USS Missouri, which was anchored in Tokyo Bay. General Douglas MacArthur, along with the Japanese foreign minister, Mamoru Shigemitsu, and the chief of staff of the Japanese army, Yoshijiro Umezu, signed the official Japanese surrender. President Harry S. Truman declared September 2nd as VJ Day. We observe this on the second Monday in August. VJ Day or Victory Day is not a widespread “holiday.” Rhode Island is the only state that officially still celebrates this memorial. We stay strong in our country because we carry and hold our history in many ways. I am raising my flag in honor of those that came before me. The POW’s, the MIA and the KIA, the members of all who served the United States and her Allies during this time in our history. Raise your flag! 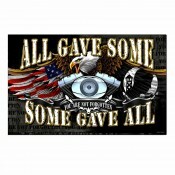 Raise them all, the American Flag, the POW/MIA Flag, the Some Gave All Flag and your Flag For the Fallen. Rhode Islanders raise your state flag because there is always HOPE. Fly them proudly!